Claudine Michele, assistant vice chancellor of student affairs, speaks to those assembled for the march. Jeffrey Stewart, chair of the Department of Black Studies, leads the walk. 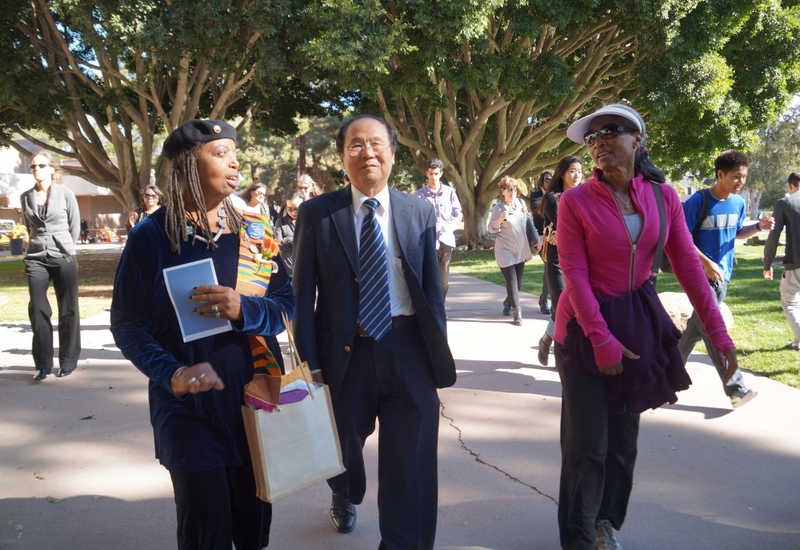 UCSB Chancellor Henry T. Yang joins the march. Pastor David Moore ('76) speaks to the assembly. A plaque at the Eternal Flame highlights the words of Dr. Martin Luther King, Jr.
A commemorative walk through the UCSB campus Friday, Jan. 15, began a long weekend observance of Martin Luther King, Jr. Day. It marks the first of several events in the Santa Barbara area celebrating the 2016 Martin Luther King, Jr. holiday. Participants in “Walk With Us” gathered at the Eternal Flame on the lawn near Buchanan Hall and then followed a course taking them through the breezeway at North Hall to view the murals depicting the Black Student Takeover of 1968. 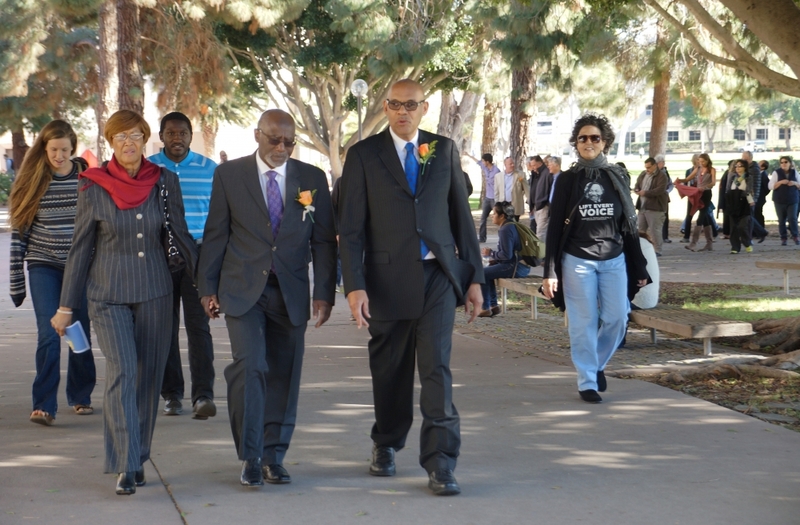 Among those joining the walk were four UCSB alumni who took part in that event, which led to the creation of the Black Studies department at UCSB as well as the Center for Black Studies Research. The Eternal Flame was a gift from the UCSB class of 1968. 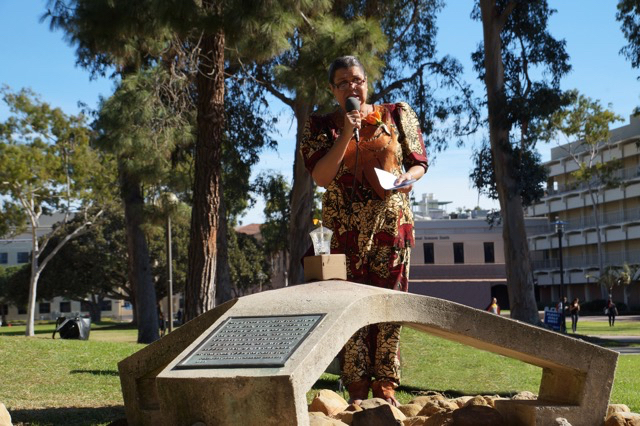 Speaking at the event were Claudine Michel, UCSB assistant vice chancellor for student affairs; Jeffrey Stewart, chair of the UCSB Department of Black Studies; Rev. Doug Miller of the Martin Luther King, Junior Committee of Santa Barbara; Pastor David Moore, a UCSB alumnus; and Marian Dance, a UCSB student. The walk concluded at Mosher Alumni House, where the UCSB Alumni Association hosted a lunch reception co-sponsored by the Alumni Board of Directors’ Diversity Committee. 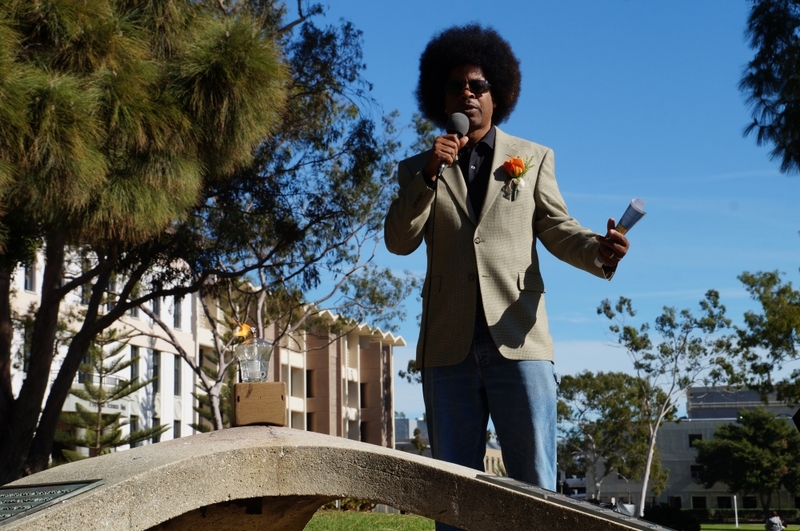 UCSB co-sponsors of “Walk With Us” include the UCSB Alumni Association, the Center for Black Studies Research and the Department of Black Studies. Also serving as co-sponsor is the Martin Luther King, Jr. Committee of Santa Barbara. The committee is co-organizing a variety of events in celebration of the 2016 Martin Luther King, Jr. holiday. The organization’s mission is to foster positive relationships among the many diverse groups in the Santa Barbara community and the surrounding areas. A complete calendar of events can be found at www.mlksb.com/calendar.